In the new issue of Metal Hammer, we have started our epic Story Of Thrash series. Part One looks at the rise of thrash metal, talking to the scene's original innovators about one of heavy music's most dominant subgenres. 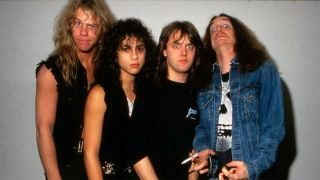 If you're new to the crazy world of thrash, we've put together this playlist of ten of the best tracks from 1983 to 1985. Turn it up loud! Debuting on 1982’s No Life ’Til Leather demo, this shredding call-to-arms was written by James Hetfield/Dave Mustaine/Lars Ulrich, a breathtaking creative team fatally overloaded with volatile genius. Breaking new ground with this collision of swaggering punk, frantic thrash and brutal gore lyrics, Suicidal Tendencies were uniting warring forces in California’s tribal wasteland. The New York City rhythm kings’ most enduring anthem, the infectious Metal Thrashing Mad inspired the name of the entire movement. More intense and complex than their debut, with this raging EP opener – now an encore staple – Slayer set new standards in full-force brutality. Originally opening the Teutonic trio’s first demo, re-recorded for a 1987 A-side, Mad Butcher encapsulates the frenzied, pulverising blur of early German thrash. Already a set opener by 1983, this archetypal Bay Area banger is a rallying cry for Exodus’s committed legion of thrashers. It’s almost a rite of passage for thrash bands to write a song called Tormentor, but Kreator’s Tormentor is even more viciously tormenting than Slayer or Destruction’s Tormentor. Overkill knew they’d aced it when this riff arrived, banging punk and NWOBHM heads together to create its own manic energy and defiant attitude. Sludgy doom riffing, operatic female vocals, devastating tempo changes; this Swiss trio burst out of left-field with a set of game-changing innovations for thrash, death and black metal. ‘It’s time for snapping some necks/Slashing, thrashing to Megadeth!’ Megadave’s earliest singalong anthem is a full-throttle love song to headbanging, powered by rattling jazz-thrash drums and wizardly solos. The Story Of Thrash Part One is in the new issue of Metal Hammer, which is in stores now and available to order online.